Heat Stress – How To Help Plants And Flowers Tackle It? Heat stress is a major cause of concern for live plants as it will affect the development of all living plants. As the global temperatures are rising every year, the heat definitely takes a toll on the plant and it has a negative impact on the plant. The increase in the heat stress means that there will be a decrease in the growth and production of the plants. As the sudden skyrocketing summer temperatures rise this will have an ill-effect on the plants, it is important to take adequate care of the outdoor plants in order to reduce its suffering to extreme heat. How Plants Get Affected By Heat Stress? Like how the heat takes the fluids out of the human body, similarly, there will be water loss in the plants due to heat stress. The first sign that the plant is suffering from heat loss is the wilting of the plant. There are a few plants that have the option of handling severe heat by conserving the water in its fleshy leaves. The most common example of water storing plant is the succulent. But, all plants do not have the luxury of storing the water in their leaves. It is important that the wilted plant is not ignored as the plant will slowly be dying and will finally turn into a brown plant. The main attack of the heat in plants is to disrupt the photosynthesis and the respiration process. There will be an imbalance in the two processes and the plants will have difficulty producing flowers and seeds. Another sign of the heat stress on the plants is the shedding of the leaves. This is most commonly seen in trees in the summer months. The plants shed their leaves in order to save water. The following are the signs and symptoms of heat stress on the plants. Some newly laid plants can suffer from sunburns due to the sudden exposure to high heat. An easy way to minimize the sunburn is to harden the plants before planting them under the scorching sun. Some plants might exhibit black spots underneath the leaves during hot summers. This can be due to calcium deficiency. It is ideal to water the plant well and to provide it a good covering of mulch. Some of the plants will experience blotting, which is a signal that the lifespan of the plant is at its end. This will prevent the plant from producing seeds and flowers. Some plants have the tendency to shed their flowers during hot weather. They will not flower until they get a conductive climate to flower. It is important to keep a close watch on the soil moisture during peak summers. Over watering newly planted plants may even kill them. Mulching the plants will also help in retaining soil moisture. Watering the container plants twice a day during high summer temperatures is advised. Use of water granules in container pots will help in releasing the excess water, it stores into the soil. You can also use rain saver water storage crystals to help plants survive the warming of extreme summer heat. It is advisable to use coarse-textured soil than the fine-textured soil so that the upper soil retains the moisture better during the growing stages of the plants. 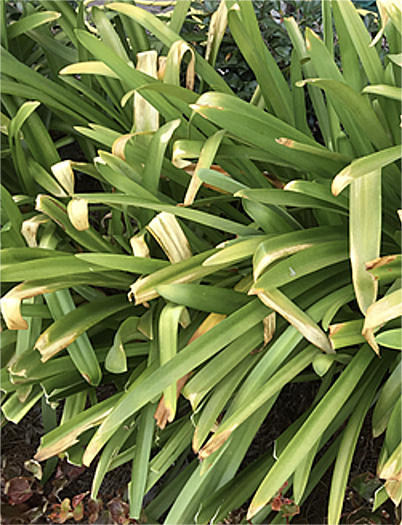 Here is a picture of an agapanthus suffering from heat stress, take note of the agapanthus long leaves with yellow brown scorched leaf tips. This is very common for agapanthus growing in a lot of hot sun especially if there is no afternoon sun protection.